Guest Post: How ‘Credit Union of Denver’ secures its network and provides business continuity to their customers…cost-effectively! ManageEngine EventLog Analyzer and ManageEngine Firewall Analyzer offers a huge set of features, strong configuration capabilities and outstanding auditing ability that allows our Information Technology group to have the necessary tools regulators expect. Both Firewall and Event Log Analyzer are the best cost effective tools for getting the most for your money that I was able to find. Its uses in our enterprise are endless. Firewall Analyzer saved us hours of research during a discovered Trojan attack. After researching the Trojan it was discovered that any workstation that was communicating to a certain IP address would confirm where the Trojan was resident. We utilized the Firewall Analyzer to quickly search for the list of IP’s in question. This allowed us to quickly identify the workstations and shut them down! 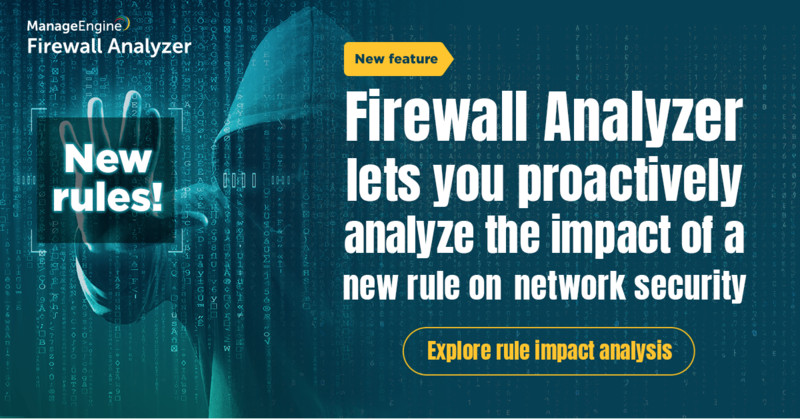 The Firewall Analyzer gives us the ability to track down potential threats. It also offers a great search tool for tracking down IP addresses. This tool offers many options that allow for tuning analysis data to better fit once LAN / Firewall Infrastructure. The tools ability to monitor bandwidth, potential threats, and LAN/WAN activity is remarkable. The ease of integrating this tool with our Juniper Firewall infrastructure made setting up quick. We are currently utilizing the SYSLOG and SNMP features for real-time results. Once we discovered how effective Firewall Analyzer was to our organization we looked at their other products. We were able to come across several other ways to increase our I.T. Department resources and save our organization money. We now use their Event Log Analyzer specifically to assist us in reviewing adverse effects of our Patch Management Process. This will allow us to look for specific issues over a large number of servers or workstations and help us identify which of those computers needs attention. We also replaced a lengthy process of Server Event Log Review with an automated process; both with Event Log Analyzer. Event Log Analyzer allows us to centralize a large part of our critical Server checklists, savings us hours of having to connect to each server to review critical events. With the security related regulatory demands that are placed on financial institutions along with the monetary constraints, these products offer an affordable solution, which eliminates the need for hiring outside resources. This is what I have determined about some of the ManageEngine products. I encourage any I.T. Manager to give them a try. It is our intent over the next several years to continue tapping into the many features that we have yet implemented, which will continue to increase our Internet security awareness and keep costs down. I am also extremely impressed with Manage Engine’s support services. Not only do they provide superb knowledgeable expertise but their posture at receiving customer feedback, enhancement requests, and turning them into real change is outstanding. As I mentioned before, I encourage any Network or Security Administrator to give any of the ManageEngine tools a try. You will be glad you did. Credit Union of Denver is a very happy customer of ManageEngine EventLog Analyzer and ManageEngine Firewall Analyzer for more than 4 years!